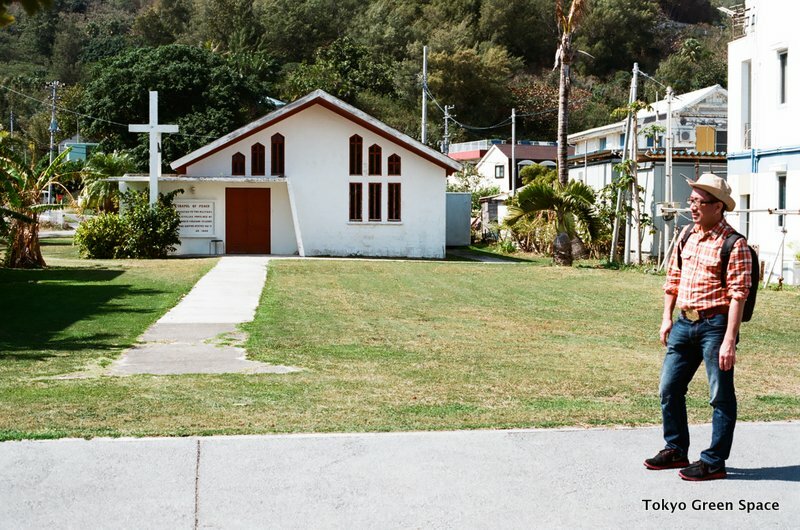 What’s surprising about Ogasawara is that there are no indigenous people. First settled in the mid 1800s by Americans who departed from Hawaii, the Japanese seized it during their colonial expansion, retaken by the United States after World War II, and then returned to Japan in the 1970s. There are numerous reminders of the war. 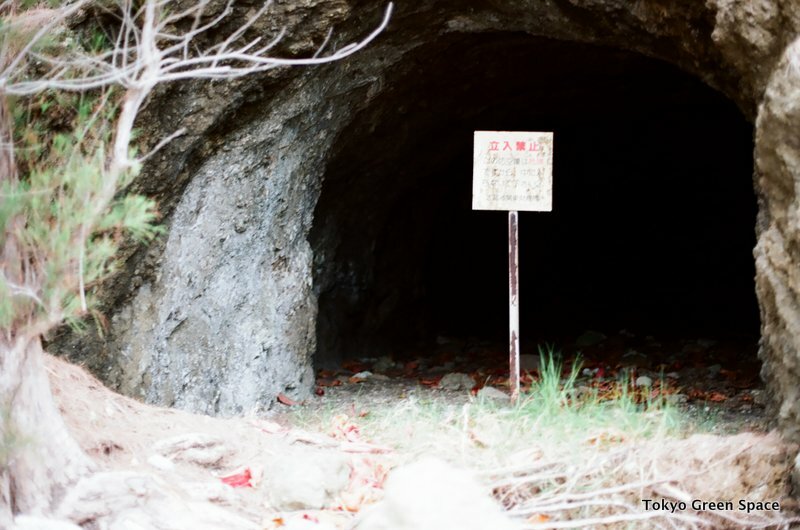 Inside the many hills you still see dank tunnels created for the island’s defense. Apparently there was no land war here, unlike (somewhat nearby) Iwo Jima. There’s also this incredibly forlorn-looking, Saint George church in the main port village. I love how the entry walkway does not meet the current sidewalk. It’s odd to be in a place with such little human history. The English name for the islands, Bonin, is a mispronunciation of the Japanese words “no people” (bu nin, or mu nin). This is the maple tree that shed the leaves on yesterday’s photo of the tiled steps. I am amazed that this tree survives despite the fact that the roots and the pavement join with no gap. Where does it find water, or nourishment? Tokyo really is a great place for growing, and its resilient plants show how much is possible. I am amazed by this illustration of how to squeeze a mini-creek into a San Francisco sidewalk (from the wonderful Streetsblog). Faced with an aging sewage infrastructure at risk of failure, San Francisco’s water utility is experimenting with bold, low-impact designs, including green roofs, daylighted creeks, rain barrels, and permeable pavement. The obstacles to this change are enormous. For decades, urban water management has meant removing green space and channeling water into treatment plants. But if successful, mini-creeks and urban watersheds can significantly reduce sewage discharge to the city’s bay and rivers, with estimates ranging from 28% reduction to 91% reduction in water pollution. In addition to the functional benefits of reduced pollution, mini-creeks will add beauty to what are now life-less streets, and attract wildlife and nature. Restoring creeks will provide a greater connection to the natural environment and urban history. I love this tiny lane in Nakano Fujimichou that extends two blocks between a larger building and a series of small residences. The proportion of pavement seems just right: soil, pavement, soil in almost equal thirds. The lane serves as access to residences, bicycle storage, laundry drying, garden, and public passageway. I wonder if the land is officially part of the ward or the residences. In any case, I imagine that it is the residents who maintain it and set informal rules about usage. The charm of this type of small semi-public semi-private space seems impossible to create by government planners or real estate developers. This is a close-up of a small tree that has survived the disintegration of its styrofoam planter box and rooted itself into the ground. It is amazing that it was able to force its way through the pavement and reach the soil. This potted tree breaking the pavement to root itself in the ground is almost the opposite of the cana flower spreading under and breaking the road to reach the air above. I find these images hopeful signs that no matter how much we pave over nature or confine it to a pot, plants are resilient, resourceful and able to confound our built environment. 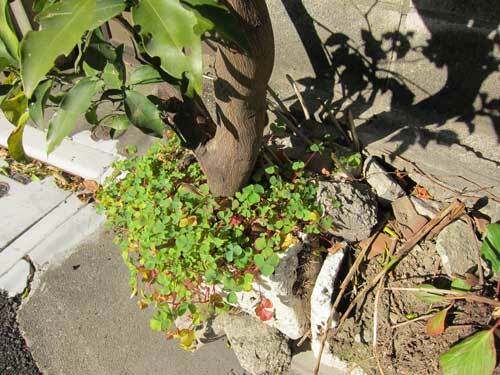 By rooting itself in the ground below the street, the tree is able to draw more nourishment and grow larger. I wish that governments and residents would begin to de-pave Tokyo, and it’s great to see that domestic plants are not waiting for us to act. On a Tokyo Metro platform, I saw some small children and their mothers gathering around and pointing. On the harsh pavement of the train platform was a praying mantis. The children began screaming and running. I don’t think I had ever seen a praying mantis so far removed from plant life. A neighbor’s garden, which I blogged about twice before, has almost ripe fall fruit. This garden consists of no more than eight potted plants and some hanging baskets, occupying a small footprint and extending two stories up to the front entrance. Above are figs, and below grapes. The fig tree seems to have busted its way out of the plastic pot and somehow found the soil below the street’s pavement. Recently I heard Robert Blakemore talk about earthworm biodiversity, ecology and taxonomy. Blakemore, a fellow at the Soil Ecology Research Group at Yokohama National University, reveals that less is known about soil than the oceans and even outer space. Soil is the foundation of our food and human life, even though in the mega-cities it is easy to forget that it is buried under the pavement. Blakemore explains that worms enrich the soil and double crop output. As such, they play a role in ecology perhaps similar to bees: essential for food production yet often invisible and in decline. The permaculture movement promotes worms for urban farming. Vermicomposting uses worms to break down food waste and turn it into fertilizer. Red wigglers, or Eisenia fetida, are recommended for worm boxes because they eat their body weight in food every day and produce exceptionally nutritious castings. In Tokyo, city-run composting depends upon each individual ward government. I wonder if many individuals or groups are using worm composting. And what about the state of earthworms in Tokyo parks and soil? Here’s a how-to for building your own worm box. Walking in Tsukishima is an interesting contrast between old and new, green alleys and wide boulevards, wood houses and new construction. Some of the alleys are remarkably well planted. The alley in the photo above seems to benefit from trees whose roots forced themselves out of their pots and through the pavement. Tsukishima and Tsukudajima survived the earthquake and the war, but the pace of modern development has outpaced preservation.